This is my interpretation of the “beef” that is used in the vegetarian pad see ew (I love pad see ew! 😀 ). Ours doesn’t taste exactly like beef, but it’s still really good! 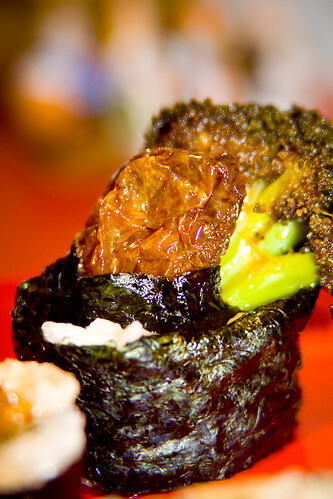 We overcooked the broccoli just a tad bit (which is why it is all black and looks dead) but it still tasted fantastic! 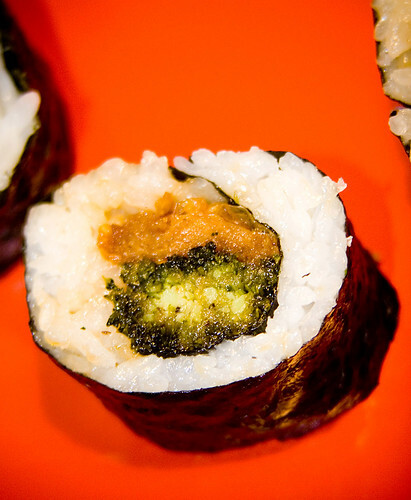 This is a great way to make sushi for your vegetarian friends or to get your kids to eat a vegetarian dish! Yum! Combine sugar, shoyu and water in a medium bowl. Rinse oagesan agè in hot water to remove the oil. Slice aburaáge into 1″ wide slices. Marinate oagesan agè in the shoyu mix. Meanwhile, cut broccoli into bite-sized pieces. Place in a bowl with 3-4 tbsp water. Put peanut or sesame oil in a wok, heat on high heat until oil begins to smoke. Place marinated oagesan agè in wok, season with pepper. If you would like, you can add a little of the marinade into the wok, but this will make it sweeter so it’s up to you. Cook until the sesame oil has been reduced by half. Add broccoli, cook until the sauce becomes gooey. 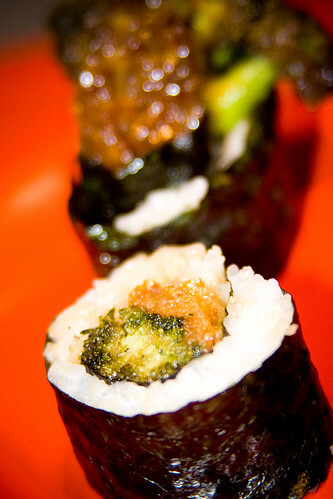 Roll the sushi, using the oagesan agè and broccoli as your fillings. Hmm, well I’m not a huge broccoli fan, but I like the idea for your fake beef. I think it would be good in a roll by itself. 🙂 I’m a pad see ew lover myself. That’s what I always order at every new Thai restaurant I try, to see how theirs stacks up. You don’t happen to have a magic recipe do you? Seems like every one I try never quite foots the bill. 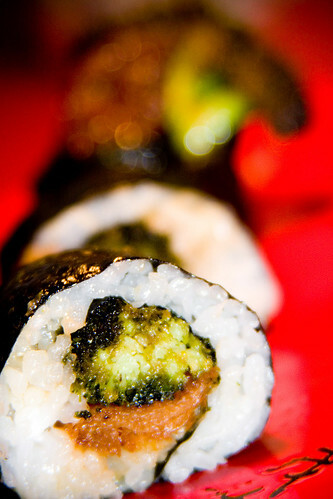 Amy – Yeah, it would definitely do well in a roll by itself! I don’t have a magic recipe… yet… but I am going to try to make some next weekend and if it turns out well, I will certainly share it with you! 😀 So glad you liked it! We’ll have to make this again sometime when you are around. 🙂 And yes…. that is an amazing restaurant!